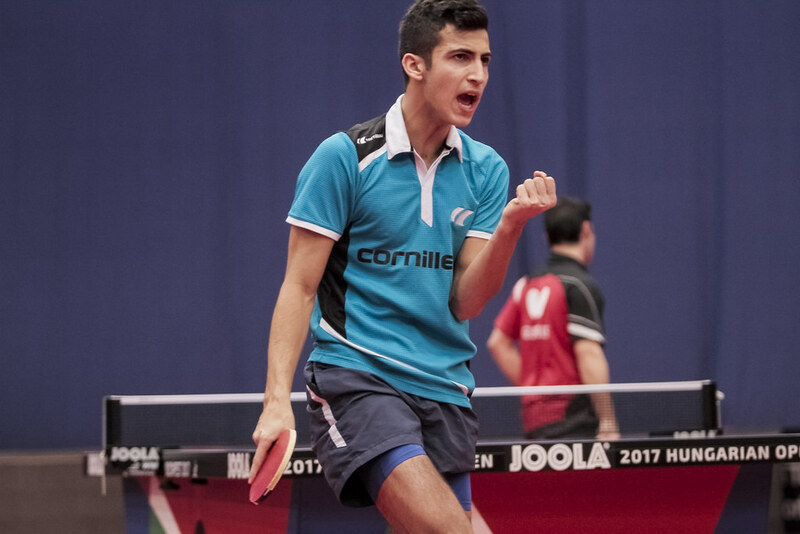 Impressive earlier in the day, on Tuesday 17th January, as play in the qualification stages of the Seamaster 2017 ITTF World Tour Hungarian Open in Budapest commenced, Sweden’s Simon Berglund continued his form later in the proceedings in the Men’s Singles event. Against expectations, he secured first place in his group. In the opening round of the Under 21 Men’s Singles event, the no.27 seed, he had beaten Hong Kong’s Lam Siu Hang, the no.4 seed (5-11 13-11, 11-3, 7-11, 11-4). Later in the Men’s Singles competition, after having accounted for Serbia’s Vladimir Radonjic in a close seven games encounter (11-6, 11-13, 11-7, 7-11, 11-3, 7-11, 11-5), he caused a major upset. He beat Brazil’s Gustavo Tsuboi in an even closer full distance duel (8-11, 11-13, 11-5, 11-9, 1-11, 12-10, 15-13). Success for Simon Berglund, listed at no.327 on the current Men’s World Rankings against an adversary named at no.79, meant that he concluded the day as one of two players to end the hopes of an adversary named in the top one hundred of the global order. The other was Russia’s Denis Ivonin, in a similar nail-biting duel, as Simon Berglund had experienced against Gustavo Tsuboi; named at no.363 on the Men’s World Rankings, the Russian recovered from a two games to nil deficit to beat Frenchman Stéphane Ouiache (4-11, 8-11, 14-16, 11-4, 11-8, 12-10, 12-10). Thus he preserved his unbeaten record and secured top spot in the group. Disappointment for Brazil and France but there was the reverse side of the coin. Named at no.279 on the Men’s World Rankings, Paul Gauzy beat Spain’s Carlos Machado, listed at no.108 (11-8, 3-11, 13-11, 17-15, 10-12, 11-9) to bring smiles to French faces as did Andrea Landieu. Standing at no.202, he defeated Nigeria’s Bode Aboidun, ranked no.188 (12-10, 9-11, 9-11, 11-8. 11-7, 11-6). Similarly, there was good news for Brazil Vitor Ishy overcame Belgium’s Florent Lambiet (11-3, 13-11, 5-11, 11-8, 13-11) to secure pole position. Surprises and as the day concluded there were more as unexpected names remained unbeaten to reserve first places. Standing at no.283, Slovenia’s Deni Kozul caused Belgium more pain by overcoming Robin Devos, ranked no.112 (11-4, 11-6, 11-9, 8-11, 4-11, 11-7). Likewise, Hungary’s Nandor Ecseki accounted for England’s Sam Walker (12-10, 10-12, 6-11, 11-9, 11-9, 11-8); whilst Paraguay’s Marcelo Aguirre defeated the Czech Republic’s Pavel Sirucek (11-7, 12-10, 11-13, 10-12, 11-9, 11-8). Presently, Nandor Ecseki stands at no.273 on the Men’s World Rankings, Sam Walker is at no.126; somewhat similarly, Marcelo Aguirre is at no.224, Pavel Sirucek at no.164. Defeat for the Czech Republic, success for Hungary but there was also the reverse situation. Listed at no.208 in the global order, Tomas Polansky ended the hopes of Tamas Lakatos, named at no.180. Surprises but other than for Stéphane Ouiache, the fourth leading name on first phase duty, it was first place in the group. England’s Liam Pitchford, Slovenia’s Bojan Tokic and the Slovak Republic’s Wang Yang all finished in top places. The preliminary rounds will be held on Wednesday 18th January; the main event commences on Thursday 19th January.